Produktinformationen "Vernier Engineering Projects with LEGO® MINDSTORMS® Education NXT"
Vernier Engineering Projects with LEGO® MINDSTORMS® Education NXT contains 12 engineering challenges for use with the LEGO® MINDSTORMS® Education NXT Base Set and LEGO® MINDSTORMS® Education NXT Software version 2 (not compatible with the EV3 system). This book is perfect to challenge upper middle school and high school students to build and program robots for testing batteries, locating “land mines”, automating plant watering, and more. The sensors used in the challenges include the Dual-Range Force Sensor, Magnetic Field Sensor, Differential Voltage Probe, Gas Pressure Sensor, pH Sensor, UVB Sensor, and Soil Moisture Sensor. 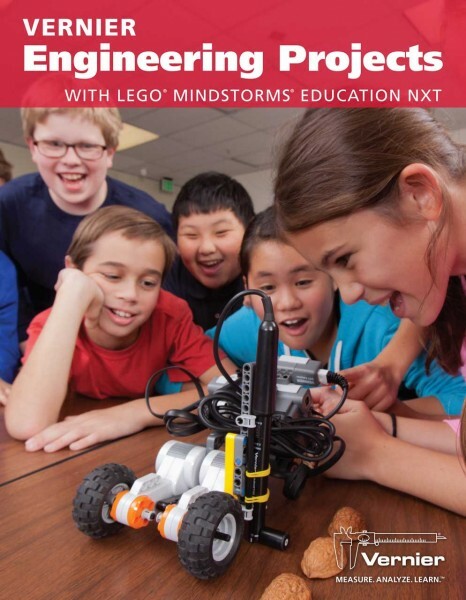 For projects with LEGO® MINDSTORMS® Education EV3, see Vernier Engineering Projects with LEGO® MINDSTORMS® Education EV3 book (EP-EV3). The challenges are a compilation from Vernier’s original STEM with Vernier and LEGO® MINDSTORMS® NXT and STEM 2 with Vernier and LEGO® MINDSTORMS® NXT lab books. Weiterführende Links zu "Vernier Engineering Projects with LEGO® MINDSTORMS® Education NXT"
Garantie(Jahre) "Vernier Engineering Projects with LEGO® MINDSTORMS® Education NXT"
Weitere Info "Vernier Engineering Projects with LEGO® MINDSTORMS® Education NXT"
Kundenbewertungen für "Vernier Engineering Projects with LEGO® MINDSTORMS® Education NXT"